We​ ​need​ ​to​ ​support​ ​our​ ​local​ ​businesses. The status quo of ignoring abandoned plazas and studying long languishing plans for downtown Framingham is unacceptable. We can support local businesses by reaching out to them and listening to their plans and thoughts for redeveloping downtown Framingham, for re-invisioning and filling our vacant shopping plazas and for creating welcoming commercial venues that service and complement our neighborhoods. The upcoming election on November 7th will likely decide these and other questions for the next decade or more. Among the fundamental differences between my opponent and me, is that I have a track record of listening to and working with the business community. Small businesses are the heartbeat of our community and the foundation of our local economy. It is key that our Mayor engage these businesses, listen to their concerns and work with them to revitalize our economy and our underutilized properties, including shopping plazas and downtown. I am a proud member and supporter of Framingham Business Association (FBA). FBA was started three years ago by 49 Framingham small businesses, to a large degree because our town government (led by many of my opponent’s team) was not listening to them. This failure to listen, a practice being continued by the Spicer Campaign, has led to our vacant shopping plazas and struggling downtown. Framingham has been engaged now for several years in the unplanned and ill-considered practice of removing parking spaces, closing streets and closing bridges without getting any input from our commercial residents. This has had a very negative impact on their businesses. There is a lack of communication about these projects that can mean the difference between a business thriving or dying. The sign bylaw, meant to clean up the proliferation of signage on Rt. 9, has had the unintended consequences of being impractical and oftentimes absurd in its application with small business and has cost small businesses tens of thousands of dollars as they have had to remove and replace their signs — some of which have been their “brand” for decades. These are just a few of the reasons businesses do not feel confident investing in Framingham. As your Mayor, I will work with everyone — including our small business owners and neighborhoods — asking the hard questions and tackling the tough issues. That is how we will work to replace our blighted shopping centers with commerce all while reducing our residential tax bills. The best way to achieve our goals is by listening to and engaging each other and working as a team. 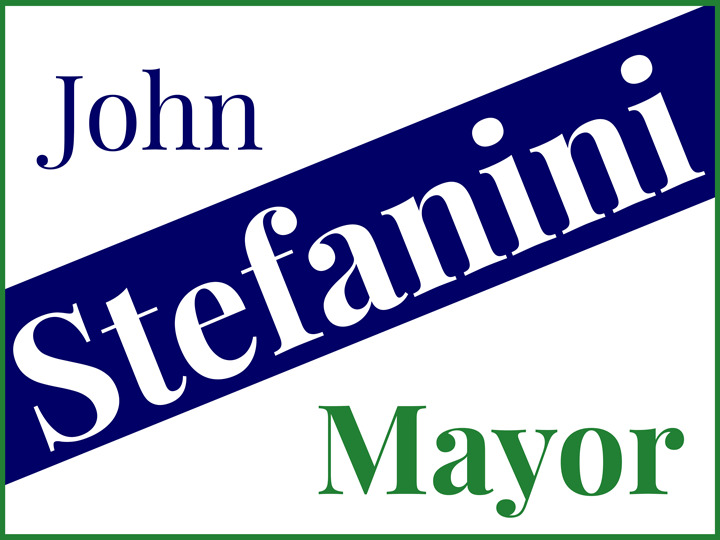 Paid for and authorized by the Stefanini Committee. Copyright 2017.